If you don’t know about Serengeti your missing out, he’s one of the most creative people in music. He has been making music for over 10 years now, and it seems the world is beginning to realize what a talent he is. Being an underground sensation in the midwest for the past decade, this Chicago native already has an impressive discography, his first two albums are classics where I’m from (South side STL) “Dirty Flamingo” from F5 records and “Noodle Arm Whimsy” from the Frozen Foods Section are underground smashes and were both recorded in Saint Louis. This is “Dirtiest Man Alive” from the “Dirty Flamingo” album on F5 records. Even though his first albums came out of STL, he is a Chi-town representative to the fullest. His music often references Chicago culture and specific characteristics that make the city what it is. In his Chicago anthem “Dennehy” from the 06 album of the same title, he raps as his alter ego Kenny Dennis who has a thick Windy City accent and lives by the chi-town code of Mike Ditka, WCKG and juicy brats. Serengeti’s music can often be described as experimental, o6’s “Gasoline Rainbows” has touches of garage rock, and the more recent project’s with producer Polyphonic have a more future electro feel, the duo released the album “Terradactyl” in 09 under the Oakland based indi label Anti-con. Geti King as he’s also known, recently relocated to L.A. and appeared on the Knocksteady podcast and talked about his midwest roots and Anti-con label mates. The Knocksteady show is hosted by Intuition (a prolific artist himself) and his partner dumbfounded. 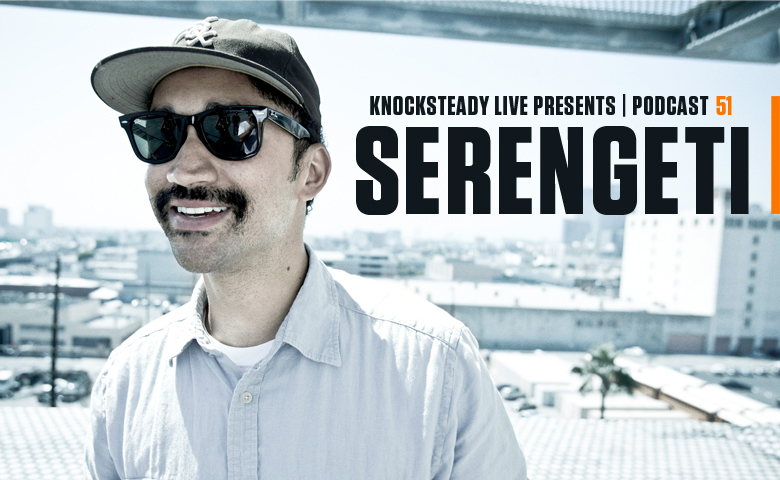 Serengeti performs 2 tracks “Flutes” and “California” from his brand new album “Family and Friends” and also “Puppy Dog Love” from “Terradactyl”. Kenny Dennis even stops by to perform “Dennehy” and talk about his beef with Shaquille O’Neil. Listen to whole thing here or download it by the small arrow on the right of the player.